Charter captains and guides consistently catch fish because they spend a ton of time on the water and understand the patterns our fishy friends follow during specific times of the year. So, odds are good that when you head out on a charter or guided trip, you’ll catch some fish. But do you want just good fishing? Or do you want lights-out, insane, once-in-a-lifetime fishing? You can increase your odds of experiencing the latter if you book specific dates throughout the year–proven dates when the bass are consistently present and hungry. This should serve as a guide, so when you book a charter during a particular period of the season, you’ll have a good idea of what to expect. And if you book one of the prime dates, expect to experience some very good fishing. Book now with Seven Stripes to get in on one of these prime dates. Trip details can be found here. Just fill out the email form on the site, or shoot us a message. This week only (11/26 – 11/30), get $50 off any charter booked. Get those dates locked in, folks! The stripers will have invaded the rivers and estuaries by now, but it won’t be consistent. A great option that has really exploded the past few years is the haddock fishing out off Stellwagen. If we get a weather window, it’s a great opportunity to bring the kids to help fill the freezer. It’s also an excellent way to begin your season and thaw out after a long winter. In terms of prime dates, it takes a few weeks for the haddock to move up to the shallower sections of Stellwagen Bank. By the first week in May, the hordes of sand eels will have invaded the SE and SW corner, and limits should come easy. 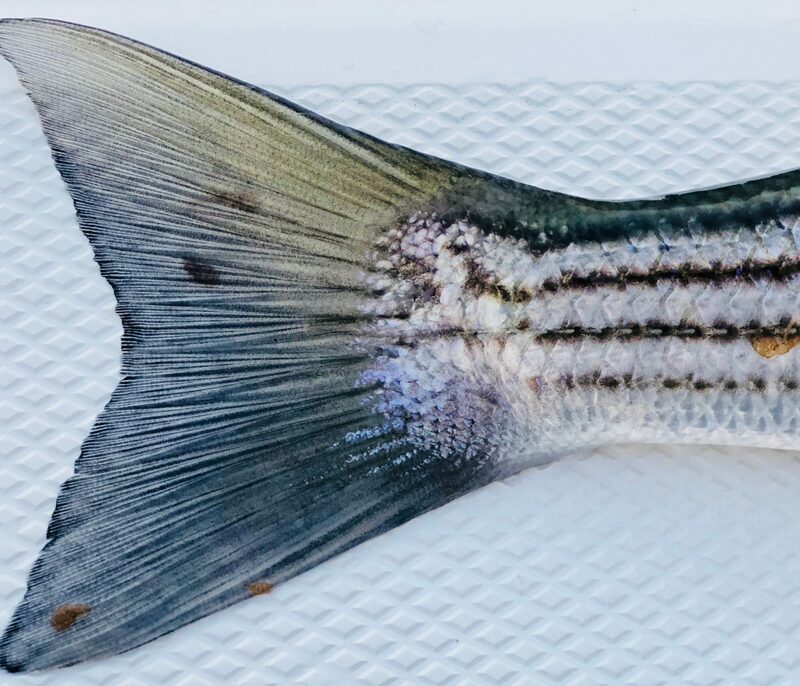 The last two weeks in May features the initial wave of keeper-sized migratory stripers into Cape Cod Bay. The schools of mackerel, herring, silversides and sand eels create a veritable seafood buffet for the hungry linesiders. Fish trend smaller early in this window, but the big girls mix in as we get closer to June. Hungry spring run stripers are the perfect target for fly fishermen and light tackle enthusiasts. Ravenous from the journey north, these fish invade the many flats, guzzles, channels and rips throughout the Bay. Dawn will be your best bite, but don’t overlook the late afternoon outgoing. The new moon period would normally be my pick, but it happens too early in the month for it the fishing to get really good. Looking forward to just after the full moon, we’ll have some pretty big tides. This should be prime time for bait smashing stripers and a perfect time to get a 28-32″ fish on the fly or light tackle. This is it. If you want to catch a big fish in Cape Cod Bay, you’ll need to fish during this window. The month of June is your best bet at big stripers feeding on mackerel, herring and sand eels on the surface. Surface feeds can be heart pounding, and double digit catches of 40″ fish on the surface are not uncommon. The new moon happens early in June too, so I’m very curious how this will affect the fishing at the Race. There will be a good bite here in the first week in June, but I’m thinking the big waves of 20 pound plus fish won’t show up until 2 weeks later around the full moon. Big tides again this month will get the schools of sand eels, baby haddock, mackerel and herring moving in the rips and off the shoals. We’ll see a bunch of surface action and a legitimate shot at a 40# fish on live bait and topwater plugs. Throwing big plugs to surface feeding fish, vertical jigging, live bait, fly fishing. Ahhhh yes, the summer doldrums. If you follow the striper reports, you may think this is the slow period. Well, not by a long shot. In fact, we’ve gotten our biggest fish of the year the last week in July and first week in August the past few years. Big schools of pogies (bunker, menhaden) invaded our coast last year and created a huge bite that lasted for a month. Mackerel moving in and out of the canal also give you a shot at a legitimate 50 pound fish (this sounds nuts but it happened a few times this past year). Mid-summer fishing can be red hot if you know where to find the bait. Pre-fall run fishing. Similar to the previous time period, if the schools of bait hang around, so will the bass. Last year was a weird year, but previous years, we found massive schools of fish hanging around the locales near the East End of the Canal. When the bass are there, it can be easy fishing, and the aforementioned cows coming through the canal are a blast to target on jigs and plugs. The Fall run can be inconsistent in our area of the Striper Coast. You can have the best fishing day of your life, followed up by a total skunk. The one thing you can count on is topwater schoolie blitzes in the harbors and bays. Plymouth through Duxbury really shines this time of year, and it will be your best bet for a full-tide blitz. The arrival of the blues make for an exciting change of pace to the striper fishing. If they find the schools of pogies or mackerel, better tie on some 50 pound flouro. Albies are also an option, but this is (mostly) a Buzzards Bay and Sounds fishery. Check out the details and book your charter with Seven Stripes here.